„New metal bands are sprouting like mushrooms these days. This makes it harder to keep up with what’s interesting in the metal scene and what’s not. One way to get control of the new bands is dividing them by their originality. Do these bands have something new and fresh to offer, or did they listen very carefully to the big(ger) examples? 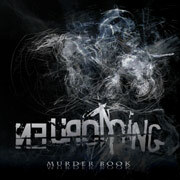 Frankly, Neurothing is an interesting band, on first sight belonging to the second category. However, there’s something strange going on with this Polish quintet. You see, this band is a clear Meshuggah-extract… but on each and every song on Murder Book they’re, using the exact same formula over and over and over again. And here’s where it gets dicey in my book: due to a severe lack in dynamics and variation, the large audience will get distracted very easily. All the rest will discover a band with potential… after a while, that is. Indeed, although the album is only thirty-five minutes long, it gets monotonous really fast. Seriously, the very first time I reached the instrumental „Last Page Has Begun”, I couldn’t help but breathing a sigh of relief I was on the last page of Murder Book. Let me give you three reasons for Neurothing’s trace of monotonousness. First of all, due to its overly complex arrangements, not a single song keeps ringing in your head more than four and a half seconds. In a certain way, the spark is missing. Also, there are practically no silent intervals between separated songs. All eleven songs seem to be mixed into each other giving the impression you’re listening to one gigantic song. Thirdly, the vocals could seriously use some alteration and flux. The almost unchanging vocals really don’t do any good in refuting the aforementioned impression. The press kit included with this album, describes Murder Book as „a real murderous trip through the human mind”. After sitting through the album a few times in a row, I can imagine to some that line must be some sort of beautiful euphemism for a splitting headache. Whatever. The bottom line is that, for my taste at least, Neurothing’s sound is bit too technical (read: overly complicated for the sake of getting across as technical). Maybe I’m a tad too critical because I’m not really into this kind of music at the moment. Maybe not. But my point this band could use a bit more variety and originality remains valid. After all, there’s nothing wrong with playing atypical rhythm structures all the time. And if there’s one thing Neurothing are really good at, it’s playing atypical rhythm structures! They’re just missing any sort of substance. Seeing this is only the band’s very first full-length release and seeing Neurothing have really enough talent and potential in store, I’m sure their sophomore album will overcome this lack in accessibility. And if they do, I’m sure this band will make it big.